(Bloomberg Businessweek) -- Just before midnight on June 5, Tony Krvaric struts around the lobby of the posh U.S. Grant Hotel in downtown San Diego wearing a red “Make California Great Again” hat and a big smile. “It’s a new day and a fresh start for California,” he says, beaming. 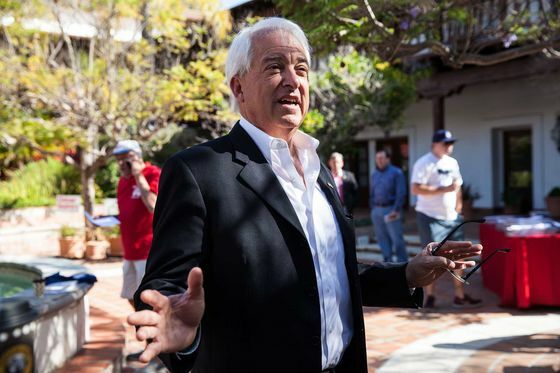 That’s because John Cox, the Republican candidate for governor, had just given what amounts to a victory speech to an overwhelmingly older, white crowd. Although Cox finished more than 250,000 votes behind Democratic Lieutenant Governor Gavin Newsom, he trounced the Democrats’ next-strongest candidate, former Los Angeles Mayor Antonio Villaraigosa. That means that under the state’s top-two primary system, Cox moves on to face Newsom in the November general election. For a state that’s seen as the epicenter of the Trump resistance movement, this wasn’t supposed to happen. 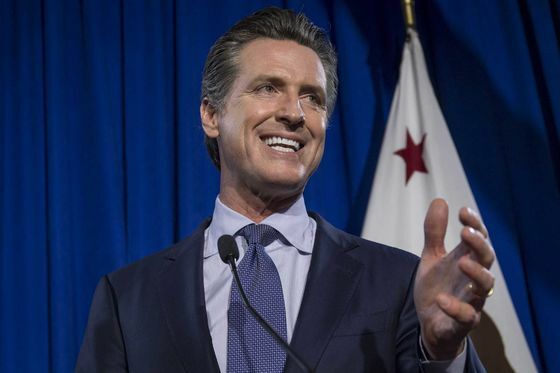 Until a few months ago, Californians had been preparing for a Democrat vs. Democrat face-off between Newsom and Villaraigosa to lead the country’s biggest, and arguably most liberal, state. That contest would have forced the Democrats into a debate about what the party stands for in the Age of Trump. Voters would have chosen either the liberal values of Newsom, who as mayor of San Francisco in the mid-2000s made a name for himself as a champion of gay marriage, and has campaigned for universal health care, or the more moderate pragmatism of Villaraigosa, who positioned himself as a fiscal conservative and hoped to carry the support of Latinos, the state’s biggest ethnic group. Instead, Newsom, 50, is all but guaranteed to follow Jerry Brown as the next Democratic governor of California. (Registered Democrats outnumber Republicans in California by almost 2 to 1.) Yet Cox’s second-place finish provides a much needed morale boost for the state’s Republican Party. It shows California may not be as deep a shade of blue as many thought. And it gives Republican voters a reason to come to the polls in November, which may end up boosting the fortunes of GOP candidates in down-ballot races. Cox, a 62-year-old real estate mogul from the South Side of Chicago, entered the race as a virtual unknown. He moved to a wealthy speck of a town just north of San Diego and became a full-time state resident seven years ago. Not only has he never held political office—he’s never won a race, having run unsuccessfully for the House of Representatives and the U.S. Senate from Illinois in the early 2000s and president in 2008. With a largely self-funded campaign that relied on small private gatherings rather than public rallies and advertising, Cox quietly wooed voters with pledges to crack down on immigration and to lower taxes. With less than a month to go in the race, a tweeted endorsement from Donald Trump gave him an edge over intraparty rivals. Yet that endorsement from the president will make it harder for Cox to reach Sacramento. California voters haven’t elected a Republican to a statewide office since 2006. State data released last month showed that for the first time, Republicans are the third-largest bloc of voters in California, falling behind independent voters with no party affiliation. Led by outgoing Governor Brown, who enjoys record approval ratings for a two-term governor, the state’s Democratic leaders have assailed what they see as an assault by Trump on California’s efforts to fight climate change and protect immigrants from deportation. Consolidating the Democratic vote behind Newsom will ultimately be good for the party, says Bob Shrum, a veteran Democratic strategist. Avoiding the clash between two members of the party will likely free up more money to flow to congressional races. There are seven Republican-held seats in districts Hillary Clinton won in 2016, and those are crucial to Democrats’ bid to recapture control of the House of Representatives. Cox’s vision of a failing California is at odds with much of the data underscoring the dramatic turnaround the state has made in the eight years since Brown began his final two terms. Its economy is the world’s fifth-largest and is outperforming the U.S. in the growth of jobs, manufacturing, and corporate profits.